View of “Lion Hunt,” 2019. The weekend preceding the opening of Reena Spaulings’s latest presentation was marked by “Act XVIII,” the eighteenth Saturday of mass jacquerie instigated throughout France by the gilets jaunes. Akin to the cipher of Spaulings, a fictional persona orchestrated by an anonymous group of artists, the movement resists monolithic structures or signaled leadership. The reflective yellow hazard vest—originally associated with the working class and recent motoring laws but now inextricable from the insurrection—unifies the protesters, despite their heterogeneous demands. The semiotic potential of the hi-viz to signal danger or a state of emergency is latent within Spaulings’s appropriation of the material as canvas. Collectively titled “Lion Hunt” (all works 2019), these new paintings reconfigure Eugène Delacroix’s 1855 Chasse aux lions (The Lion Hunt) into a series of fragmented parts. They are exhibited alongside Mollusk, five marble sculptures in the shape of bodyboards that lean like looted tombstones against the gallery walls. Like the ongoing uprising, Delacroix’s style was criticized by his contemporaries for its extremes and incoherencies, while others—notably Baudelaire—commended its intensity and revolutionary spirit. 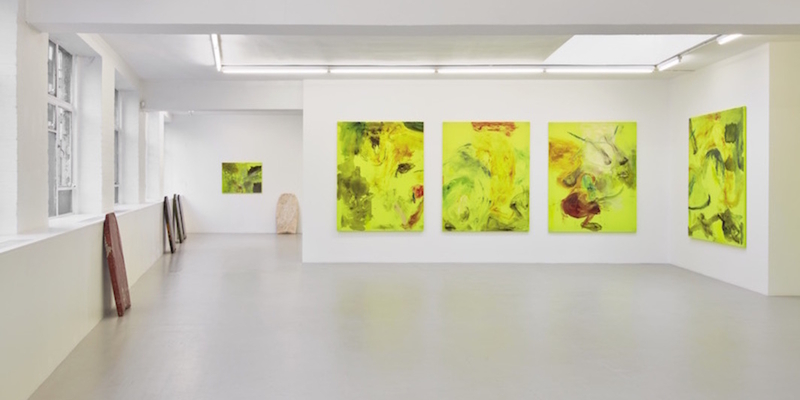 Spaulings riffs on Delacroix’s alacritous, frenzied brushstrokes, homing in on the brutal fray where beast and soldier meet and extending the abstract turmoil across multiple fluorescent supports. Against the resistant neon fabric, the acrylic paint is darkened—bloodied and muddied. The charred effect perhaps alludes to the partial destruction of the original work during an 1870 fire at the Musée de Bordeaux. The colors also bring to mind the tortured expressionism of Rothko’s “Seagram Murals,” and there are shades of Henri Rousseau, too, particularly in the unexpected revelation of a tiger in Lion Hunt 20, the final painting in the show. This convergence of multiple art-historical references is mirrored by the shared labor of Spaulings’s collective hand, which flattens each work’s divergent textures into an illusion of cohesion. Harald Sohlberg, The Country Road, 1905, oil on canvas, 37 1/2 x 43". As curator Kathleen Soriano notes, Sohlberg argued that he developed his oeuvre independent of external influence. “Painting Norway” reveals instead that he, a gifted draftsman and colorist, was intentionally or otherwise in dialogue with the crucial early movements of modern art—from his use of cloisonnism and saturated hues in portrayals of the remote mining town of Røros to sylvan and churchyard scenes that presage the uncanny vacancy of René Magritte. Most of the works here are landscapes, but they also gesture to Norwegian folklore and its sense of an animate wilderness. This was important in Sohlberg’s day, to generate a national style in the century after independence. Retrospectively, this balance of genre, formalism, and mysticism locates him in a tradition at once modernist and mournful. The show crescendos to the arresting Winter Night in the Mountains, 1914, his magnum opus. 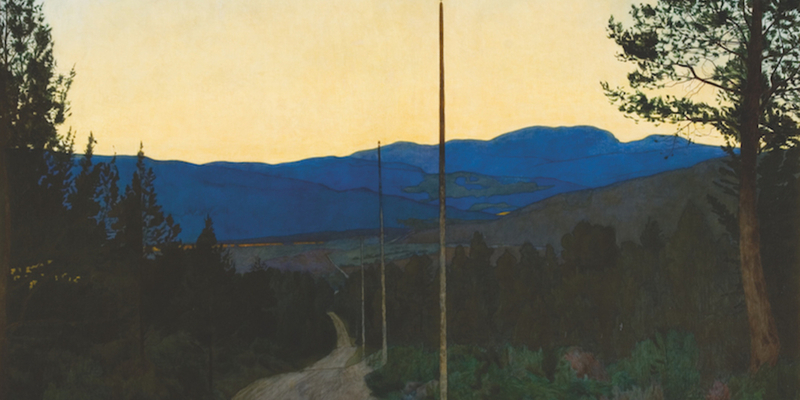 Better still is The Country Road, 1905, a subtle study of alpenglow punctuated by a row of telegraph poles, marking the ineluctable march of change.